Whampoa is a trove for great food, and this stall counts as one of those that should be checked out. This is at the food centre side of Whampoa, not the market side. There is somewhat a perpetual line at this stall, but the line does move fast. Chinese-styled, you get to pick from a variety of dishes to heap atop your rice, although you are welcomed to go for the usual ikan billis, chicken wing, cucumber and egg as well. The selection is plentiful and ranges from the fried processed favourites, such as luncheon meat and sausages, to more home-cooked options. My personal favourites are the squid and curry vegetables. Besides the fragrant rice, the sambal at this stall really stands out as well. Sweet and not overwhelming spicy, this marries perfectly with a small portion of ikan billis. 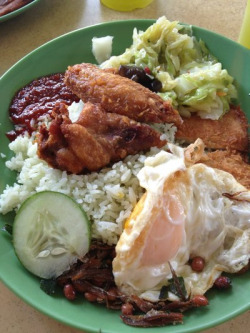 A good plate of nasi lemak. I will eat it if I am around the vicinity, but it is not enough for me to crave for it. It is quite difficult to find good Nasi Lemak at Night near my area unless of course you make your own. Unless of course you take a walk or drive down to Whampoa Market for Lunch or dinner. For lunch, it is relatively crowded due to the lunch crowd from Balestier or near by those areas but done tbe suprised if you find a crowd at night as well. Before the market renovated many years ago, it moved to a temporary holding site at an open field, it was still there, great tastes and same freshness. When it moved back to the original site in 2006 or 2007 i cannot really remember, it was still serving fresh stuff. Why do i say so? You can see the cook, frying up eggs, chicken wings, fish fillets, luncheon meat... Need i go on?? The main point is that it remains fresh and oily but good. I usually buy a packet because i like the comfort of my own home in the afternoon and you are able to choose what we want to order. 1 serving of rice, fried chicken wing, 1 sunny side up egg, 1 chicken sausage and 1 piece of luncheon meat finished off with some sweet and spicy sambal tumis. Service is good and systematic, it is fast and they get the orders correctly! Ok it is a hawker centre, dont expect super super clean environment but you can expect something good enough, the food, the style and the esscence of Whampoa. When you come here, you really dont know what to get, try this out very affordable around 3 to 4 bucks and it is quite hard to find thiese kind of prices nowadays. Some people might think it is heavy to have nasi lemak for breakfas but i liked it. I like to have it with coffee or tea. I am fussy with the rice. 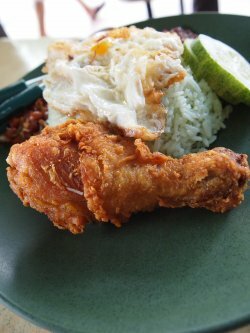 A good nasi lemak rice should have nice coconut taste like this one. This one is quite nice. The chicken wing is nice too. The fried egg is also well fried with the egg yolk just nice. The chilli is also nice. This is a stall worth recommending. 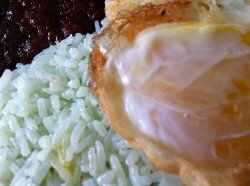 Nasi Lemak - a pleasant surprise. The prominent signboard gotten my attention when i was there for lunch. It reminded me of another stall at Jalan Besar. Upon ordering, i asked the Uncle whether they have another outlet at Jalan Besar. He replied, 'this is their only outlet!'. I pointed to one of their sets shown on their signboard, i was telling him that i wanted t this set but would like to replace the chicken wing with a chicken drumstick. The Uncle told me it would be an additional $1.00 to make the change. I paid a total of $3.50 for the set. The rice came in the nice color of light green. When bring it closer to my nose, i could actually smelled the nice fragrance of pandan leave. The set came with ikan belis and peanuts, a fried egg and a fried chicken drumstick. I requested for additional sambal chill to be added. The sambal chill was rather aromatic with a distinct spiciness. The chicken drumstick was well-marinated and well-fried to achieve the nice crispiness. The fried egg was nicely done with its egg yolk in orange color, soft and runnery.